What's for dinner tonight? If you want something that's low in calories, high in nutrients, and simple to make, this recipe for Chicken Breast With Shaved Brussels Sprouts should fit the bill. 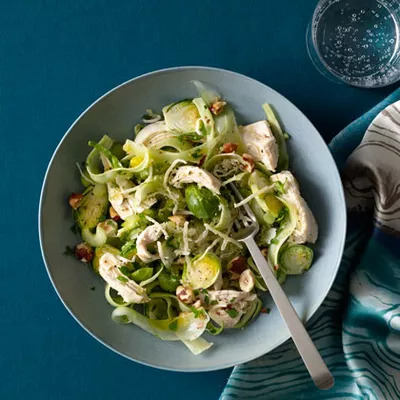 Think crunchy vegetables like Brussels sprouts and broccoli, combined with savory chicken and tangy lemon juice for a salad that's full of flavor and texture. At only 309 calories and 3.2 grams of saturated fat, it's a lean, diet-friendly choice. Added bonus? It's loaded with superfoods. Brussels sprouts are high in protein, vitamins A and C, folate, potassium and fiber; broccoli and celery have cancer-fighting phytonutrients; hazelnuts have B vitamins and heart-healthy fats; and chicken is an excellent source of protein, which helps support a healthy body weight and aids muscle growth and development. Plus, the lean meat is rich in selenium and B vitamins, which are good for boosting your metabolism and keeping your energy levels high. If you happen to have some leftover chicken, add it to your salad to cut down on cook time, making things a little easier. This salad also keeps well in the fridge, making it a good choice for a brown bag lunch that you can take to work.